For same day Vinyl to CD/MP3 transfer service email or call our Orlando Orange County location at (407) 610-2451 for same-day service availability. We provide a full service professional audio transfer services for conversion of vinyl records to a digital audio format. Our audio transfer studio offers a complete in-house service that features high quality audio digitizing services. For vinyl records transfer and conversion service email or call our Orlando Orange County location at (407) 610-2451 for same-day service availability. Guaranteed competitive local prices and unparalleled service! Your original vinyl records never leave our conversion facility – everything is done on premises. No outsourcing. If you need your audio CDs copied after your vinyl records are transferred, we offer same-day on-premises CD duplication services. Interested in transferring your audio and video tapes to CDs and DVDs? Check out Tape to DVD transfer service. Our customers have asked us about our vinyl to digital CD audio conversion process flow. 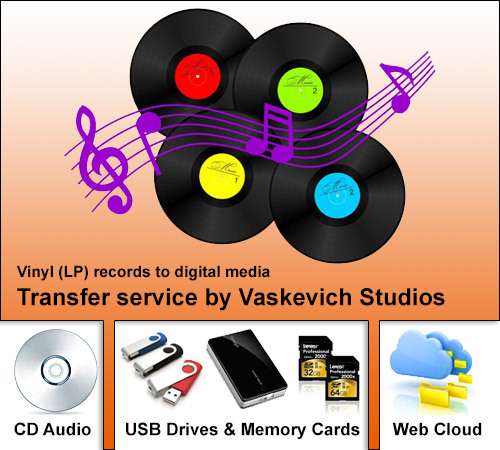 There are numerous ways of getting a vinyl record transferred to a digital format. We have been in business of converting analog audio to digital format since 2003 and have utilized various methods and equipment for vinyl records conversion. Currently we utilize high quality Sony and Pioneer turntables that are connected to a studio audio production console. Once the analog sound is adjusted, leveled and optimized, we take the output from the audio production console and feed it into a professional studio digital audio interface to digitize the audio from the vinyl record turntables into an uncompressed 48kHz 24 bit stream. After the audio stream has been digitized, we further optimize the audio by normalizing the levels and applying specific EQ settings. If the vinyl record audio needs compression or limiting, we also apply it at this stage. Any noises or vinyl record needle noises can be reduced as well. Once the process of digitizing and processing of vinyl record (LP) digital audio is complete, we compress the audio per customer’s specifications to an MP3 format or compile a CD audio disc by down-sampling the 24bit 48kHz audio back to red book compliant audio CD stream which is 44kHz 16 bit audio. This creates a CD audio disc that is compatible for playback on any CD audio playback device, including computers. 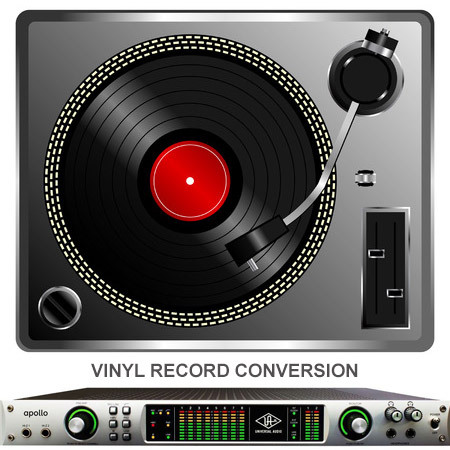 We also can convert any vinyl records digital audio to various MPEG file formats. Since we digitize and transfer all vinyl phonograph records on location, we’re able to follow any special requirements that customer’s may have. These transfer service requirements may include but not limited to special sound processing such as noise reduction, pop and clicks removal, editing of specific segments of the audio, compression of the final digitized audio material to a designated digital file format and etc. For conversion of vinyl records and photograph LP records email or call our Orlando Orange County location at (407) 610-2451 for same-day service availability.